My journey as a nurse in search of alternative approaches to personal and community health and the environment’s relationship to it. Recently, local news in South Florida is buzzing with headlines about the invasion of green algae that seems to have taken over many beaches, rivers, canals and other waterways in the area. Governor Rick Scott has even declared a State of Emergency in counties such as Martin, Palm Beach and Lee. 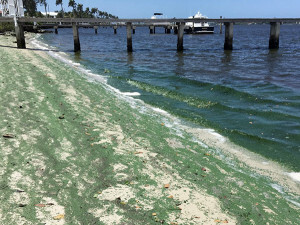 The algae are a sort of thick green sludge that some say “smells like death.” Officials warn locals and visitors to stay out of the water as it may be toxic and cause respiratory issues, skin rashes and other unknown health problems. The marine life in these areas have had it the worst though as thousands of fish have died and many manatees that drink fresh water are in search of drinkable water sources. Living right on the ocean in Palm Beach, I am literally watching this environmental health crisis unfold before my eyes in my own backyard. I am so saddened by these occurrences and I wonder what I can do to help and to prevent this from getting worse. Sources say that the algae blooms are from the outflow of polluted water from Lake Okeechobee into nearby rivers. There are many long-term effects from this environmental hazard that we all must be aware of. Tourism is taking a big hit as many local fishing and boating charters rely on the river and waterways for their industry. Marine life, including recently un-endangered manatees are struggling to survive through the sludge. The algae are being tested, but may be toxic and cause long-term respiratory issues. If not contained, the algae may spread to our drinking water sources and water may be undrinkable. Although this terrible news had been heard locally in Florida, I feel that it must be taken to national news to get the story across. Environmental news should be national news as it affects us all. We must work hard to create awareness and be sure to not let this happen to other areas around the United States. Do what you can to keep our water clean. Clean water means healthy lives.